Thin slices of tenderloin marinated in black pepper, coriander, all spice and olive oil, baked in Mini Yorkshire puddings, topped with a Mustard Dressing made with ground sun dried tomatoes, oil and coarse-grained mustard. Very elegant. With olive oil, lemon juice and peel, prosciutto, goat cheese, figs and arugula. Thin sliced loaf of bread or filo cups, topped with shrimp, mayonnaise, grated parmesan cheese, shredded Swiss cheese, Worcestershire and a dash of paprika. Consist of olive oil, fresh spinach, feta cheese, ricotta cheese, dill, nutmeg, \egg, flour and red bell pepper. These Rolls are always a hit at parties. Rolled in tortillas is cream cheese, sour cream, mayonnaise, curry powder, soy sauce, crystallized ginger, raisins, scallions, bacon bits and pineapple. 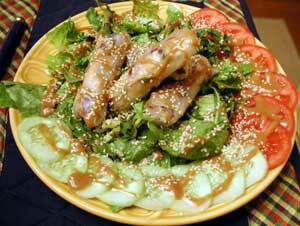 Carrots and asparagus are rolled in thin grilled beef, tied with green onion top and dipped in sesame seeds. Steamed mashed Potatoes holds the Cakes together with chopped green onions, fresh dill, grated lemon peel, fresh breadcrumbs and vegetable oil. Bite Size! Individual presentation, delicious and very appealing. Round Croquettes made with Cream Cheese, smoked salmon, fresh dill, Hot pepper Sauce, Breadcrumbs and Flour. This recipe can also be made larger since they are made in muffins pans and be served as a side dish. Beautiful presentation of Puff Pastry Purses which include butter, zucchini, garlic, Parmesan cheese, Brie and thin slices of Prosciutto. Bite size also made with Filo Dough. Also with the Cheddar is combined walnuts, parsley, onions and fresh bread crumbs. Spread on individual toasts, made with cream cheese, mayonnaise, crabmeat, Parmesan cheese, marinated artichoke hearts, green onions, red bell peppers, celery, Italian parsley, Sherry wine vinegar and some hot pepper sauce. The Ultimate with an explosion of flavors!... 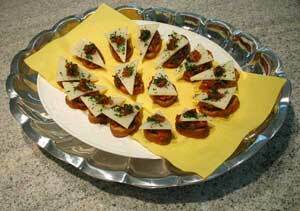 Wedges of baked Brie in puff pastry placed a top a sauce made with butter, honey, minced garlic and fresh parsley. Prosciutto is spread with Boursin and Honey Mustard first, then wrapped around the Asparagus. Crab, Mango, Mint leaves, lime juice and wasabi wrapped with toasted dried nori. Beautiful presentation. Grape leaves stuffed with prosciutto, dried fruit and herbed rice. With pine nuts, golden raisins, dill, parsley, currants, lemon juice and chicken broth. Eggplant rounds are baked, topped with a mixture of garlic, parsley, parmesan, anchovies and olive oil. This mixture is then topped with mozzarella and ham, the rounds are folded, drizzled with tomato sauce and baked again. Delicious on Herbed flat bread. Made with red wine vinegar, plum tomatoes, garlic, roasted bell pepper, jalapeno chili, hazelnuts, olive oil, blanched almonds and fresh parsley leaves. A mixture of mild goat cheese, cottage cheese, egg yolks, flour, thyme and rosemary is baked on pastry dough; served as individual bite size servings. 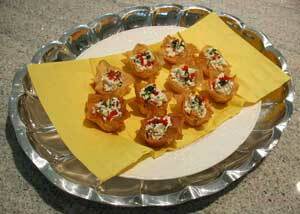 Jicama wedges are topped with a mixture of crab meat, lime juice, tomato salsa, garnished with fresh coriander leaves. Flavorful toasts with black olives, Parmesan cheese, mayonnaise and green onions. Bacon, spinach, cream cheese and red onions are rolled on flour tortillas, cut across and baked. Fresh spinach, sautÃ©ed in oil with garlic, is pureed with sour cream and green onions to create this delicious dip, with broiled pita triangles and assorted fresh cut vegetables. A unique appetizer of white beans on garlic toast with also carrots, celery stalks, Romano cheese, Italian parsley and rosemary. A roasted garlic and pea mixture is spread on toasted French Baguette and topped with grilled asparagus and sesame seeds. Asparagus and cream cheese wrapped in dough and baked. A strip of Salmon and Cream Cheese wrapped around a freshly steamed Shrimp. Also with Cream Cheese, Spices and red onion on small bite size toasts. Served with crackers, made with dry white wine, half and half, cream cheese, Roquefort or Blue Cheese, grated onion and garlic, paprika. Also served with your choice of crackers, made with cheddar, pecans, mayonnaise, grated onion, garlic and tabasco. A classic but delicious. Also with bread crumbs, garlic, parsley, lemon juice, hot pepper sauce, onion and thyme. Tasty little bites made with cottage cheese, Bisquick, eggs, sour cream cream, butter and of course shredded Cheddar. This one is for provolone, pesto, sundried tomato and garlic lovers! presented in layers like a pate and cut crosswise it is a beautiful sight! With Saga Bleu Cheese and dry sherry mixed, slices of ham rolled, baked and cut in a puff pastry. Made with chopped onions, Cognac, thyme, anchovy paste, cream cheese, butter and parsley. Garnished with hard boiled egg yolk powder. A unique and delicious appetizer. Also has chopped pimiento, salad dressing, onions, pecans, flaked coconut and parsley. Bite size quiches with your choice of sea food and cheese that will complement each other. Filo Dough triangles, baked and also filled with pine nuts and dill. Filo Dough triangles, baked and also filled with almonds and spices. Beautiful presentation with also slivered red and yellow pepper. 2 shrimps interlaced on a skewer and grilled, previously marinated in Soy Sauce and Garlic. Almost bite size, a favorite. 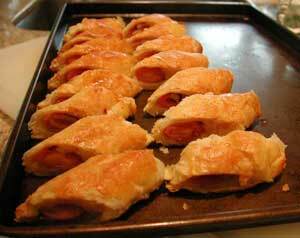 Strips of Ham and Swiss Cheese are rolled in Puff Pastry and Baked. The shrimp stands up in the cup filled with cheese. Looks a little bit like Sushi, beautiful presentation, wrapped in a very thin slice of cucumber and finished with a sliver of red pepper. Bite size quesadillas filled with Brie and a mild Salsa, an unusual and delicious combination, topped with a drop of sour cream. The original recipe, served at room temperature, garnished with lemon wedges and a mild garlic yogurt Sauce. The crust baked first with olive oil and a hint of garlic brings out the flavors of the bruschetta. Also garnished with yellow and red pepper is a beautiful presentation. A side dish presented as an appetizer, bite size. The Polenta is made with chicken broth and various vegetables mixed in. The one and only, with the freshest steamed Jumbo Shrimps available. Jumbo Claws, cracked and fresh, served with a mustard sauce. The cup is first filled with Salmon Cream Cheese, beautiful presentation, the yellow pepper can also alternate with red pepper. 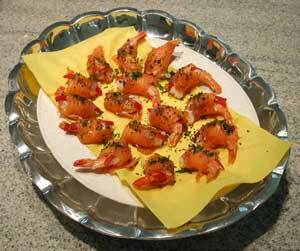 A great starter, very elegant with a hint of paprika, cayenne pepper and topped with a lemon wedge. Dip consist of bacon, minced clams, cream cheese, sour cream, red bell pepper, scallions, basil leaves, horseradish, lemon juice, Worcestershire sauce and Tabasco to taste with garnish and Pita toasts. Presented from a ring mold with lemon slices, olives and sliced tomatoes as garnish. With a touch of Tabasco, dill it also incorporate dill, eggs and heavy cream. A true delight and delicate taste. 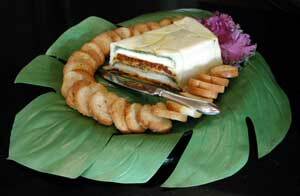 Garnished and served with your choice of crackers. Matzo-meal, onion, parsley, pine nuts, eggs, mint, salt, pepper and ground turmeric. Delicious with toasted bread or raw vegetables. With fresh thyme, lemon peel, garlic and olive oil. Unusual and excellent. The crust is made with bread crumbs, Parmesan and butter. The filling is olive oil, onions, red bell pepper, wild mushrooms, cream cheese, whipping cream, gouda cheese and parsley. The polenta also has cheese, jalapeno peppers, garlic, green chili, cilantro, almonds, olive oil and red chili peppers. The tarts are made with white bread, includes shallots, mushrooms, flour, whipping cream, chives, parsley, lemon juice, Parmesan cheese and sour cream. Olive oil, garlic, fresh rosemary, Honey Pear preserve, lemon peel, Brie and chopped pecans. They are crustless quiches with also green onions, garlic, eggs, Parmesan, ricotta cheese, yellow cornmeal, mustard, milk and red bell peppers. With ground crackers, butter, sundried tomatoes, sour cream, cream cheese, blue cheese and parsley. Bite size with milk, eggs, butter, flour, salt and calamata olives. Risotto cakes made with chicken stock, white wine, olive oil, Arborio rice and grated Parmesan. Topped with a mixture made of wild mushrooms, celery, carrots, leek and white wine vinegar. The batter is made with ale, flour, egg white and black pepper. Dipped in a Tartar sauce made with mayonnaise, dill pickle, green onions, capers, parsley, lemon juice, Dijon, tarragon, Worcestershire and hot pepper sauce..
Made with butter, olive oil, onions, garlic, flour, chicken stock, whipped cream, sour cream, spinach, Parmesan and cayenne pepper. Served warm with toasted baguette slices. Crisp, freshly cooked shrimp are wrapped in Prosciutto slices and marinated in a Balsamic-garlic vinaigrette. A bleu cheese dough coated with sesame seeds and freshly baked. The Brie is mixed with saffron, heavy cream, egg yolks and butter. Phyllo dough pastries stuffed with a mixture that includes potatoes, fennel seeds, cumin, turmeric, vegetable, onion, chilies, gingerroot, garlic, spinach and butter. Served warm with toasts, made with leek, Vidalia, artichoke hearts, spinach, brie, garlic, olive oil, white wine, heavy cream, parsley, dill, tarragon, crab meat, Dijon and Tabasco. Parsley, shrimp, onions, scallions, cream cheese, sour cream, mayonnaise, bottled chili, lemon juice, horseradish, garlic, lemon pepper and Tabasco. The Caponata, a piquant Sicilian dish, is made of eggplant, yellow bell pepper, onion, garlic, brown sugar, lemon juice, salt, golden raisins, capers and parsley. Besides sweet potatoes we have olive oil, scallions, roasted red bell peppers, coriander, tomatoes, garlic, balsamic vinegar, salt, pepper and jalapeno chili. Served with baked tortillas. Layered in mini cups, with olive oil, onion, eggplant, thyme, garlic, sugar, tomatoes, goat cheese, lemon juice, white wine vinegar, arugula and zucchini. It truly is... with sharp cheddar cheese, toasted pecans, mayonnaise, onions, garlic, Tabasco and... strawberry preserve. With Sharp Cheddar, toasted pecans, green onions, bacon and mayonnaise.